The Chicago Blackhawks already played a trump card this season when firing former head coach Joel Quenneville, so what’s next for the Central Division outfit? The team managed just one win in its first five games after 33-year-old Jeremy Colliton took over behind the bench to go along with two losses, an overtime defeat and a shootout failure. If they don’t start picking points up soon will fans see the club tank to take a shot at Jack Hughes in the draft lottery next summer? I think it’s a little early for Chicago to write the season off as one hot week could launch them back into the thick of the playoff race. However, they do need to accumulate some points in the near future before it’s too late. A quick look at the team’s individual stats would indicate there’s been a bit of a problem with the backup goaltending as Cam Ward’s goals-against average was 3.81 at the quarter mark of the season while playing nine of the team’s 20 games. His save percentage was also lacking at 89.1. On the other hand Corey Crawford, who was injured to start the year, had a 91.6 save percentage along with a 2.57 GAA. 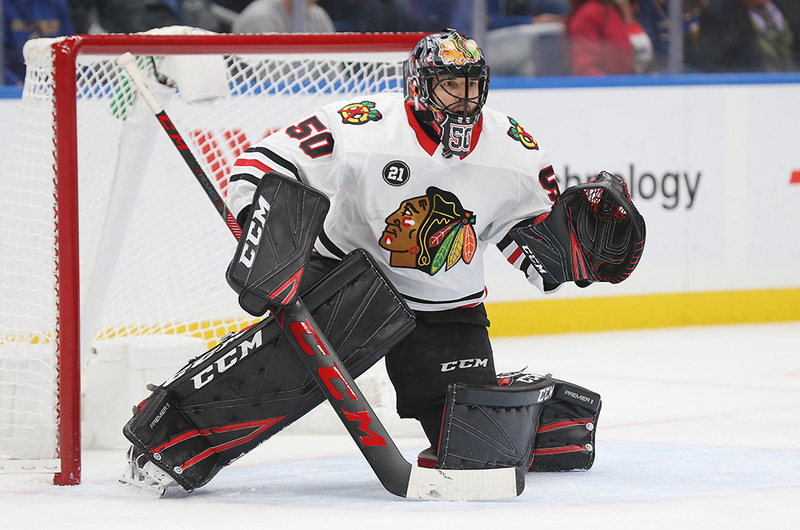 It leads me to believe that Crawford needs to start as many games as possible and the Blackhawks’ season depends a lot on him staying healthy. The team is also relying a lot on 19-year-old Finnish defenseman Henri Jokiharju to carry a heavy workload. The rookie teenager was drafted 29th overall in 2017 and he chipped in with nine assists in his first 20 NHL outings. He was even on the plus/minus scale while doing a fine job up to now. However, he’s been playing an average of 21:30 per night for the squad, which ranks fourth-most on the team. Jokiharju has basically been thrown into the deep end of the pool and is expected to learn on the job. But once the dog days of February arrive he might find it hard to keep up with the length of a grueling 82-game NHL schedule. The Blackhawks’ blue line thins out after Duncan Keith, Erik Gustafsson, Brent Seabrook and Jokiharju with the likes of Gustav Forsling, Brandon Manning, Jan Rutta and the currently injured Brandon Davidson in the mix. If Jokiharju can’t keep up with the workload as the season wears on then perhaps general manager Stan Bowman should look into acquiring a top-four defenseman if possible. Offensively, the Blackhawks top guns haven’t been too bad as Patrick Kane, Jonathan Toews, Alex DeBrincat and defenseman Brent Seabrook have been pulling their weight. They need more production up front from Artem Anisimov, Brandon Saad, Dominik Kahun and Nick Schmaltz though as they’re all getting enough ice time to make a bigger impact. Schmaltz scored 21 goals and 31 assists in 78 games last season and is on the last year of his entry level contract. He needs to pick up the pace if he hopes to land a good-paying deal from Bowman. Schmaltz has played both the wing and center for Chicago and has sometimes found himself lining up alongside Toews and Kane in both even-strength and power-play situations and needs to take full advantage of it. Colliton has been experimenting with his line combinations since taking over and fans have also seen right-winger DeBrincat playing on the third line with Kahun and David Kampf on the left wing. DeBrincat notched a team high 28 goals along with 24 assists in 82 games last season and is on pace to better those numbers this year. He wasn’t really demoted to the third line as Colliton is trying to spread the offense out as much as he can and is hoping DeBrincat can help lift Kahun and Kampf’s production. Many fans would like to see DeBrincat playing on the wing across from Kane, but Colliton believes a line with the two of them together would be a bit on the small side. DeBrincat’s just 5-feet-7-inches tall and about 165 lbs while Kane’s only three inches taller and about a dozen pounds heavier. It’s also thought the line might be a tad weak defensively. Anyway, line combinations aren’t carved into stone and fans should expect to see Colliton try out several different possibilities until he can come up with four cohesive units which click. For instance, Saad has recently been playing on the wing along with Kane and Toews on the top unit, but how long he’ll remain there is anybody’s guess. We’ve also seen DeBrincat playing alongside Schmaltz and Anisimov lately to see if they can inspire each other. The Blackhawks have numerous good players, especially up front, but it may take Colliton another week or two to settle on some permanent lines. It better happen soon though as the club was ranked 25th in goals scored in mid-November while the goals against were fourth worst. However, with all the forward talent the Blackhawks possess perhaps the biggest disappointment so far has been the power-play. After 20 games the team had scored on just 13.11 percent of their man advantage opportunities. With the power-play being such a vital part of hockey today and games being won or lost with it, that would be the first thing I’d try to solve if I was Colliton. I think the rest of the problems will eventually work themselves out as the team is too talented to struggle for the entire season.